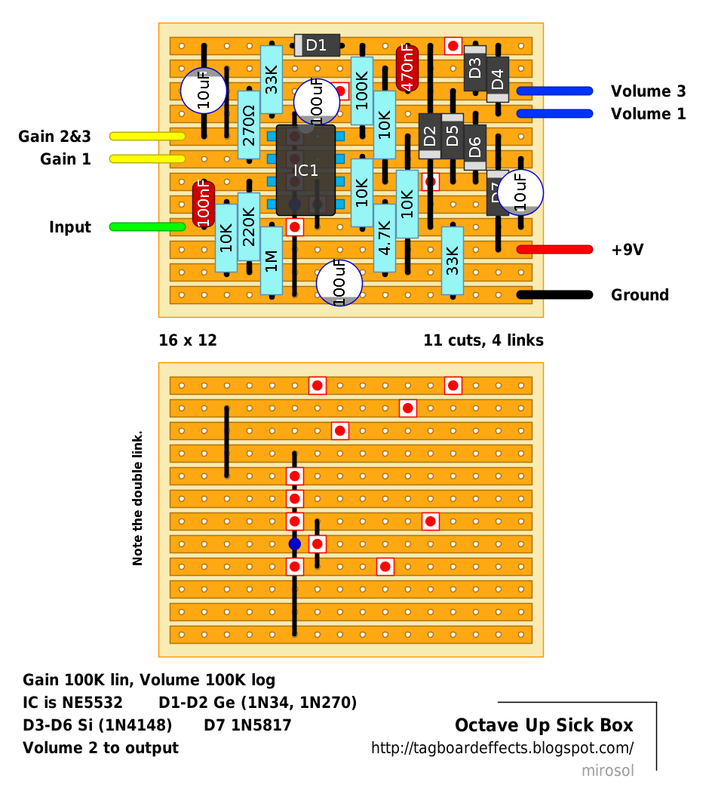 Gus Smalley's "Octave Up Sick Box". And demonstative video from one cool dude who's been around the blog sometimes too. He also has a few words of wisdom to share! Check it out! Very Entertaining clip. Quite funny in parts. Loved it. Thanks for the post. Cool, this sounds somewhat similar to the Zvex machine, anyone else think that? What is D7-1n5817? I can't find it on any of the schematics online. Also, could you use 1n5818? Thanks! That's polarity protection diode i added. You can use 1N5818 or just go with 1N4001... Or you can omit it altogether and take the +9V wire to the fifth row. Thank you! Learning more from this page everyday! this is my fav octave up. like in the video, you can pretty much make it work all over the neck with either pickup. i'm getting ready to rip it out of the box in the video and stick it in another box with a fuzzface in front of it. thanks for the kind words, too.. If I accidentally wired the battery backwards, would I burn out one of the components? I have good volume in bypass. When I step on the pedal, I have the effect, but it's very quiet. An electrolytic could potentially have failed, but measure voltages or try with an audio probe to check there aren't any other issues. Thanks for the quick reply, Mark! I'll check the electrolytics. I'm terrible at troubleshooting, so I appreciate the direction. Done. Used 1n914s for all diodes just like Gus suggested you could on the d.i.y. site. Still plenty sick. 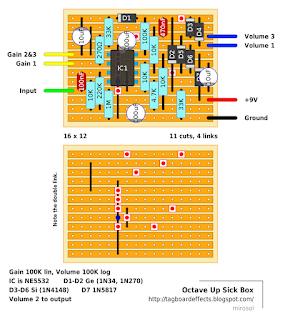 was chatting with gus about this and if you wanna make it a little less over the top, you can use a 50k gain pot instead of 100. i did this on mine to make it a little more useful in everyday situations... it's still quite over the top, but ya kinda loose the octave down the neck some.. so you may wanna consider adding a switch so you can put maybe a 47k resistor in series with the pot..
then you can have the "mellower" or the "sicker" version of the pedal. also tried to add a simple tone control. that was a pain, and really didn't work out so well. i ended up taking a tap off the input to the circuit to the top of a 50k pot and a .047u cap to ground.. it cleans it up a little bit, takes out some of the stridency. not sure if i like it yet. thanks for layout, mirosol! just build it (not boxed yet as usual )). i'm using 1n3592 diodes (which are good) and found the sound nice but too chaotic. the key was the 270R resistor. i've change it to 1K and wow - i've got less gain but decent octave sound, no more harsh weirdness. i think i've try to reduce the gain to 50K later. This is without a doubt the coolest octave up fuzz ever! Everyone I know who has tried mine, want's me to build one for them. I made one for my friend Bjarte, the songwriter of the amazing band "Kvelertak", and he absolutely loves it and uses it all the time. Gus should really consider to get this one into production in some way. I think it would be a huge success. So far I have built 4 of them, but I do not charge anything except for the cost of the parts. I hope Gus feels that this is OK.
Is there anyway I can replace the NE5532 with a TL072 ?? I don't have any NE5532s laying around right now. But I would love to make this circuit up. Thanks in advance! And love the website. They are generally interchangeable, so I guess you can use the TL072, maybe it could sound just slightly different. The TL072 is low noise, but in case you can hear some noise you can search the NE5532, someone says that is even more silent.